The Catalina 320 was introduced in 1993, along with little sister the Catalina 270, as the first in a series of designs intended to go head to head with the more contemporary, roomier, euro-styled designs of some of Catalina’s competitors. It was an instant success and remains in production in 2002 with something in the neighborhood of 1000 units built to date. The most notable difference between the Catalina 320 and previous Catalina designs is the way in which the beam at the transom, compared to the maximum beam, is considerably increased. The beam at the transom of the Catalina 320 is 87% of the maximum beam while that of their earlier models was closer to 60%. This is certainly not a Catalina innovation but an industry trend that can result in as much as 10% more interior volume for a given length and translates to added space for accommodations. In addition, cockpit space is considerably increased. The 320 measures 32’6"; LOA, beam is 11’9"; and draft, with the standard wing keel, is 4’3". A deep draft keel with bulb is offered as an option and draws 6-feet. Displacement of the shoal draft model is 11,700 lbs and 11,300 for the deep draft version. Construction of the hull of the 320 is basically a solid fiberglass laminate, although, before I get into trouble with another reader, Coremat, a spun-bound polyester fabric, is incorporated in some areas. This material is primarily used to build up laminate thickness and is not typically considered a core constructed composite. Balsa wood and plywood core materials are used in the deck and cabin structures. The interior of the 320 is made up of molded fiberglass liners which, in most cases, serve a dual role as structural reinforcement and foundations for berths, lockers, and joiner work. Vinylester resins are used in the first layers of hull laminate to reduce the possibility of osmotic blistering, and Catalina offers a five-year warranty against blisters. I could get picky about some of the cost saving methods used in the construction of the Catalina 320 but, for more than 30 years, Catalina has built tens of thousands of boats following their time-tested methods with a remarkable success record. Some 1993 models were known to have problems with improperly routed wiring that resulted in chafed and broken wires. Catalina has retrofitted these problem boats with PVC conduit and redesigned later models to eliminate the problem. On deck, the T-shaped cockpit with pedestal-mounted wheel steering offers comfortable seating for five adults. The centerline helm seat mounted just forward of the stern rail is removable, the center section of the stern rail folds aft and down making for a handy swim platform and boarding ladder arrangement. The side decks are uncluttered except for the necessary genoa track, and the mast shrouds are well inboard for easy passage and improved sheeting angles.There is a storage locker on the foredeck for anchor and rode storage. The interior of the 320 is designed with the port-to-port cruiser in mind and little thought given to sailors who make overnight or extended passages. There are comfortable in-port accommodations for two couples or a small family. The layout includes a V-berth cabin forward followed by the main saloon with a settee to port and convertible U-shaped dinette to starboard. The galley is aft to port and has a stove, oven, top loading icebox, double sink, and suitable counter space. There is a small navigation table just forward of the galley which, in a pinch, could be used as extra counter space for meal preparation. The head and the entrance to the quarter berth cabin are opposite the galley. The head includes toilet, sink and integral shower, and the quarter berth cabin has a large, athwartships double berth and hanging locker. There is adequate storage below the berths and cushions, although hanging locker space is limited, and there is no wet locker for wet foul weather gear, a feature which is all too often overlooked on current production boats. Catalina has used Yanmar and Westerbeke as well as Perkins diesel engines of either 27 or 28 hp as standard auxiliary power at various times throughout production. All are freshwater cooled, all are dependable, and all have good service support just about anywhere you are likely to sail. All provide sufficient power for this 11,000+ pound boat, and personal preference is about the only reason I can see for picking one over the other. The average weekend cruiser will be well satisfied with the performance of the 320, and the weekend racer may be just a bit surprised. Although the waterline length is considerably shorter, and the sail area to displacement ratio is about the same as Catalina’s 34 footer, the Catalina 320 has better boat speed. With the factory supplied 150% genoa and fully battened mainsail, she will point to within 40 degrees of the apparent wind, and the wide beam and the low center of gravity of the fin and bulb keel result in a stiff boat. The helm is light and well balanced; in fact, so well balanced that some complain it is difficult to feel and keep the boat in the groove. I suspect this is just a matter of getting used to the feel of the boat. Catalina Yachts has endured the ups and downs of the recreational boating market for more than 30 years by giving sailors what they need. And, while many of us dream of sailing off to the far corners of the earth, most of us do our sailing close to home and for all too short periods of time. 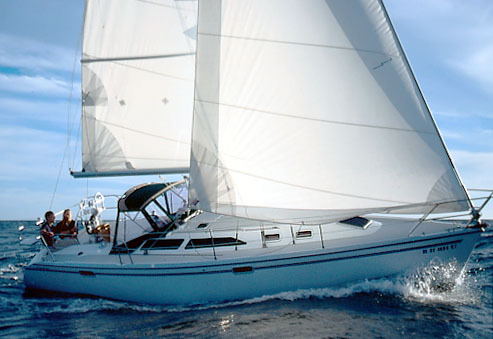 For those of us in this category the Catalina 320 offers a well-designed and affordable choice.